Was looking into this rifle for a while and when the price came down I made the choice to jump on it. Looking forward to taking it out! I've been getting good groups with my buddies one of these and decided I needed one for myself. what does the AAC-SD designate? BEST ANSWER: Advanced Armament Corporation - Silent Discharge, It's basically a collaboration of Remington, AAC, and Houge to create a suppressor ready realiable work rifle. Not sure what the “SD” is but AAC is a suppressor company. This rifle is treaded to accept one. I love mine it’s scary accurate. And not too finicky on what bullets it likes. The AAC-SD in the model name actually stands for Advanced Armament Corp. - Suppression Device. I believe the AAC-SD designates that it is suppressor ready due to the threaded barrel. AAC makes a can for the .308 (7.62 x 51). Google ‘AAC-SD’. You will find links to can on Silencer Shop. BTW-Great rifle. I consistently shoot .25” MOA @ 100 yds with Federal Premium 168 gr Sierra Matchking’s. AAC is a suppressor manufacturer. SD usually denotes a suppressed version. This rifle has a threaded heavy barrel, so it's "suppressor ready". It refers to the threaded barrel. You can throw and AAC suppressor on it if you wanted where as the other version does not have the threads. BEST ANSWER: Yes, the floor plate is removable. There are kits to convert to a removable magazine. Owen, The rifle is exactly like a stock Rem 700. The floor plate swings down when released by the tab located inside the trigger guard. It allows access to the previously loaded ammo. It does not separate from the rifle. It's a hinged floor plate, but you're going to want to replace the stock pretty quickly anyway. Its about as stiff as a 90 year old man who forgot his viagra. Yes. It has a hinged floor plate. I would not consider it removable though. It has the factory plate on it, that is hinged. Best stock bolt gun. Fine out of box; even better with upgrades. I would recommend this rifle. It's accurate, and you can change things around to better suit your own taste if need be. My experience with grabagun.com was stellar, so I highly recommend them as a merchant. Thanks! Other than the stock trigger being just a hair gritty, this is a fantastic rifle. Very true shooter. It was really purpose built for an AAC 762 SD silencer, and boy do the two work out very well with subsonic ammo. Suppressed groups of less than 1” using inexpensive factory subsonic ammo. Great rifle. Remington accuracy right out of the box. Tack driver right out of the box. Highly recommend this rifle. Great gun at a great price! Showed up exactly as described. Really a good feeling gun, this is a gun I am not afraid to throw on my shoulder and trek through the woods. Gun shoots really well. Pretty good rifle for the price. Not quite as accurate as my 700 SPP, but still pretty good. Replaced the trigger with a Timney, added a scope and it'll hit 6" plates all day long at 500 yards with 168g BTHP Matchkings. This rifle is dead on with 168gr BTHP Matchkings. Couldn't ask for a better experience. ADD SCOPE AND SHOOT 100-300 YARDS WITH EASE! Great for beginner or pro. Just add scope and you're able to shoot out to 100-300 yards. That will grow with use. ENJOY! The stock was even more flexible than reviews had prepared me for. 10 minutes with a dremel fixed that no problem. It's still a 700 with HB, and it performed great on the first range trip at 100 yds. Consistent sub 1 inch with 150gr Federal, and cloverleaf with 168 Sierra. Nice. I love the rifle- very accurate! I got a great price and fast delivery from Grabagun.com. I replaced the stock with a Bell & Carlson M40. I shot a five shot 0.342 inch group at 100 yards today. 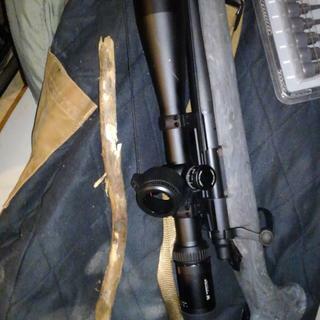 I put a Bushnell two peice picatinney scope base mount and a 35mm Millet 6x25 LRS scope with TPS rings. Using Lapua 308 cases, Seirra 175g Match King bullets, Hodgen CFE-223 powder, and Federal Gold Metal Match primers. I added a JP Enterprises muzzle break. It reduced recoil 50%. I can't wait to test my Silencerco Omega suppressor when the tax stamp arrives. I adjusted the X Mark Pro trigger to 3 lbs right out of the box and the gun was no longer safe as the firing pin would drop when closing the bolt. The trigger is poorly designed as the sear and hammer separate when activating the safety. I quickly replaced the trigger with a Timney which is set to 2 lbs. The Hogue stock looks great, feels great, but is too flexible for accurate shooting. The 308 is a wonderful cartridge. It shoots flat and provides a wide range of bullet weights and styles to choose from in 30 caliber. Great price, reliable platform, you can't go wrong! I've been looking for a Remington 700 in .308 for some time now and the 700 AAC-SD did not disappoint. Throw in the fact grabagun.Com had the rifle for sale for about 150 less than I'd found elsewhere, I really can't complain. Just threw a muzzle break on it and waiting for my glass and I'll be all set. This a great rifle in any form. Everything that people say about the stock is true, it has to go. It is very flexible. Allows the barrel to touch the stock when on a bipod or rest. I can pinch the two together with my fingers and very light pressure. Other than that, the rifle is great! Factory threads, heavy barrel, light crisp trigger. 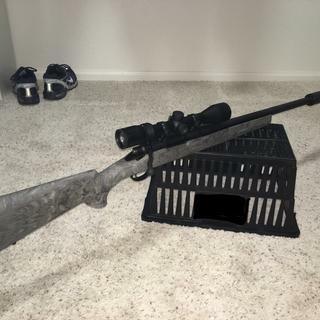 Remington 700 quality and name. So-far I am very pleased with this rifle. I didn't even mess with the Hogue overmolded stock as I had already planned to stick it in a B&C before I bought it. Zeroed right after 30rd break in and it gave 1" groups. I'm confident those will tighten up as copper build up stablizes. I will also be bedding the recoil lug, but I'm going to wait and see if it starts grouping better without bedding. Grabagun shipped the gun within their allotted timeframe, although it was closer to 7 days than 5 if my memory serves. All in all, I have no complaints about this purchase, or the quality of the gun. I found this to be an excellent base rifle to start off with if you want to get into Long Range Shooting... I ended up lapping the lugs and the barrel- but now she shoots holes in holes at 100 yards. Some folks get a winner right out of the box- mine I had to put about $35 dollars of work into it. I also upgraded the stock however the original is nice, it is not a solid "accurate" stock. Either way I am very happy with this rifle and the use I will get out of it over the next few years. design, ensuring uniformity, strength, and solid bedding area. The 20"
stock, and a threaded muzzle.